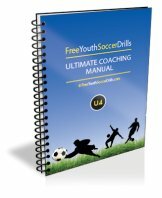 Coaching youth soccer can be great fun and the kids will love this U4 game! Coaching youth soccer needs to be fun, especially when the the young players are only 3 or 4 years old. It can be difficult coaching this age group when all they want to do is run to their mum and dad. This game was created to allow the kids to be close to their parents whilst playing to stop them from wondering off or getting upset. The parents will be standing inside the area, spread apart from one another with their legs together. The kids will be next to you and on your command will dribble (kick) their soccer ball in and out of where their parents are standing still. This is a good time to get some coaching points in. When you shout "tunnel ball" the parents will open their legs wide and the young players have to kick (pass - inside of foot) the ball through the legs of the adults. The kids should then retrieve their ball and continue to dribble. When coaching youth soccer remember to be patient and if something isn't working be prepared to change it. A nice little progression for this game can be to get the kids to crawl through the adults legs after they have kicked their ball through. Kids love getting dirty and being mischievious and this will add a little fun to the game. -> Get the kids to say with you 'oh no big toe' to encourage them not to use their toes to kick the ball between the parents legs. See other ideas for coaching youth soccer by clicking here!